With PHPFox Neutron, you have the option of paid subscriptions which allows different paid features. Here comes the need of websites with multiple currencies as your users may not necessarily use USD, EUR or a GBP. To manage the currencies on your website, you need to access your website’s admin dashboard and navigate to the Currencies section located in the Settings Menu. To add a new currency click on the New Currency button located at the top right corner. Currency ID - Enter the abbreviation for the currency you wish to add. Symbol - Enter the symbol of the new currency. Phrase - Enter the actual name of the new currency. Is Active - Set the new currency as active/inactive. 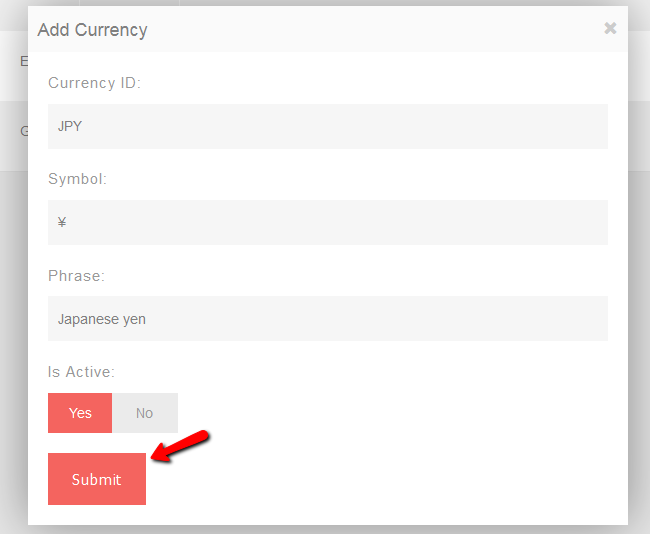 For the purpose of this tutorial, we will add the Japanese yen as a new currency on the website. Click on the Submit button to create the currency. To delete a currency you will need to click on the drop-down arrow next to a currency in your Currencies manager and click Delete. You will be prompted with an additional confirmation window. Click ok and the currency will be deleted. To change the default currency that will be used for calculations and will be displayed on your website, you will need to navigate to your Currencies manager. Let us say that you want to make the newly added Japanese Yen as a default currency. To do so you will need to click the Default button corresponding to that currency. Note that the dollar didn’t have a default button to choose. This means that this was the default currency up to the change. Now the Japanese Yen will no longer have a Default button meaning that it is the new default currency.